At the beginning of the fall semester, I showed up to my Thursday night Business Law class ready to soak up all the information that was going to allow me to do well in the course. I’m a ‘laptop student’, so usually once the teacher starts talking, I’m go go go, typing away until the lecture is over. The end result is ten pages of notes that I think will be useful once midterm and final exam times come. But this night is different. As I get my fingers ready for speed typing, I look around at all other 239 students also ready to play stenographer, and I realize that there has to be a better way to do this. Was copying word for word what the professor was saying really the best way for me to absorb the lecture content into my brain? Although I was unsure of any alternatives at the time, I knew the answer was no. So sticking to my ‘inquiring green’ personality type, I set off on a quest to find a better way to maximize my knowledge absorption from the lecture. Luckily for me, this was a short quest as I found my solution very quickly. A few weeks prior to that night, I had been introduced to a free concept mapping software called Visual Understanding Environment (VUE) at a meeting at the University of Guelph. Originally I was looking into the potential of this software for curriculum mapping purposes, but I quickly discovered that this program was exactly what I was looking for as an alternative to note-taking. With VUE I was able to get more out of the lecture for some very basic reasons. Firstly, with a simple colour coding feature I was able to categorize and group information in a way that was visually stimulating (which works out well for me because I consider myself a visual learner). Hence, although it sounds a bit elementary, when I went back to my ‘map’ for studying purposes, I was better able to recall information because I could associate concepts with easy colour cues. Secondly, unlike most word processing programs, the non-linear setup of VUE allowed me to connect and relate concepts that may not have fallen in the same chronological point of the lecture. So if a concept node from the first part of the lecture was on the top left of the page, I could easily link it to another concept node from the last part of the lecture on the bottom right of the page with an arrow. Magical, right? Thirdly (and significantly related to the last point), I was able to see a concept in its context, instead of as a solo idea. With the arrow feature and non-linear setup, I could focus not only on what the concept was, but also on how it relates to other concepts by linking ideas or grouping them together. Fourthly, and most importantly, I indirectly became more engaged in the lecture as I was forced to constantly search for the interconnection and relationships of information instead of seeing a concept in its own bubble. Therefore when the lecture was over, instead of having ten pages of notes that meant nothing to me because I was typing the whole time instead of listening intently to the professor, I walked away with a visual interpretation of a lecture that had significant meaning to me. Although my VUE study maps may seem confusing, chaotic, and unorganized to an outsider, to me they are clear, ordered, and relevant because I created them in a way that best suits my learning style. 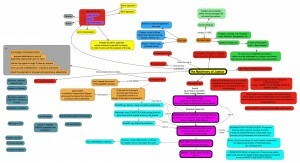 So is concept mapping software the saving grace for every student hoping to get the most out of a lecture? Probably not. But for other people like me who have a short attention span, and learn better if they are visually stimulated, I can see VUE and other concept mapping software being very useful. In fact, recently I received my highest grade ever on a mid-term and my only study materials were VUE concept maps. Coincidence? Perhaps. But I prefer to believe there is some type of correlation. The way I see it, the majority of students have become ‘possessional learners’ where they try to gather as much information as possible, believing that that is the key to their success. However, simply possessing information doesn’t mean that one will be able to recall, interpret, or remember it. In fact, an abundance of information might become more confusing than helpful. What students need in this time of information overload are ways to sort and filter incoming information so that their brains can absorb only relevant concepts. It’s been said that our brain can only hold seven pieces of information (plus or minus two) at one time. So instead of overcrowding it with meaningless facts, we should be aiming to fill it with significant and personalized concepts. All I know is that for now I have traded in Microsoft Office Word for VUE, and I’m loving it. I would encourage anyone out there who is bored with standard note-taking and wants to try something more engaging to do the same. I like your point of view regarding the use of mindmaps in class. I am always open to try new ways of taking notes at university but I always ended up returning to pen and paper. The main reason for me is this: I study engineering and there is a flood of diagrams and calculation. Of course the idea is not to remember all the diagrams, but still a lot of small sketches help me a lot to remember the ideas (I would call me like you a visual learner). A possible solution would be a mindmap on paper which turns out to be very inflexible. Another solution would be using pen and paper only for sketches and digitize them afterwards to embed them in the mindmap. I would like to know how you deal with visual content like diagrams and sketches.